If you follow my Instagram stories, then you might have seen my many failed attempts at trying to make ladyfinger cookies. Traditional ladyfingers are made with whipped egg whites, so I thought, that’s an easy peasy sub, just use our new friend aquafaba. It turns out these cookies were not my friends and did not want to cooperate. So after 3 failed attempts, 8 spongey cookies consumed, and a mountain of leftover chickpeas, I had to form a new plan of attack. 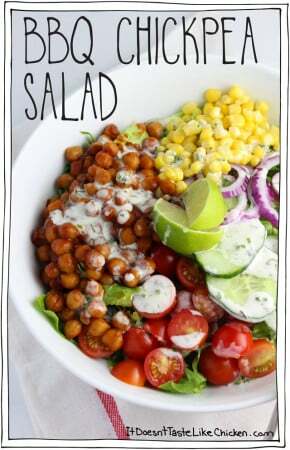 Creamy Lemon Pepper Chickpeas! And what a lovely plan it was. When it comes to cooking, I truly think the mistakes tend to guide you (if you let them), this unintended recipe, was a very, very, very good idea! 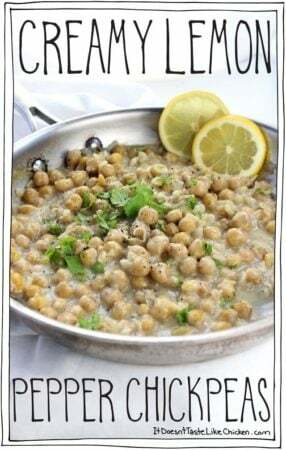 Just 20 minutes to make this easy, creamy, zesty lemon, peppery, totally addictive chickpea dish. Holy smokes these chickpeas are delicious! It took everything in me not to polish off the entire pan myself. Perfect as a side served with salad and some potatoes or rice, spooned over pasta, or as a scrumptious open faced sandwich on top of toast. You’re going to want these saucy chickpeas everywhere! More news: Now that my cookbook Fuss-Free Vegan has been released for pre-order (OMG still losing it with excitement!!! ), I have a bit more time on my hands so you’re going to see things changing and improving on the blog, starting with today’s new recipe layout. What do you think? Notice the cool new feature where you can change the servings, then the recipe sorts out the math for you! I ‘m diggin’ it. 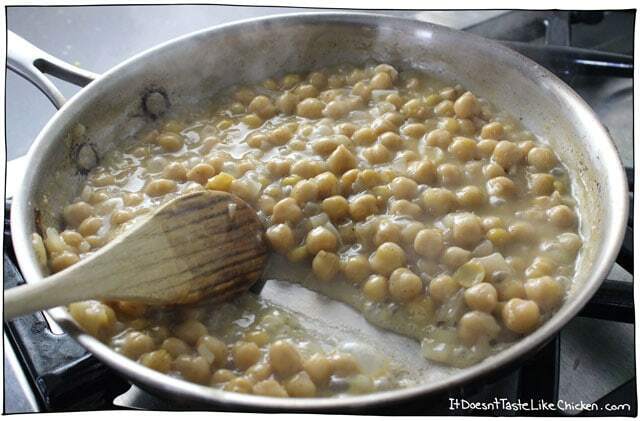 To make Creamy Lemon Pepper Chickpeas: Sauté the onions and garlic until they are translucent and beginning to brown. Then sprinkle in the flour and stir and cook for an additional 30 seconds to heat up the flour. Add in the vegetable broth, lemon juice, lemon zest, salt, and pepper, and stir scraping up the bits stuck to the bottom of the pan. 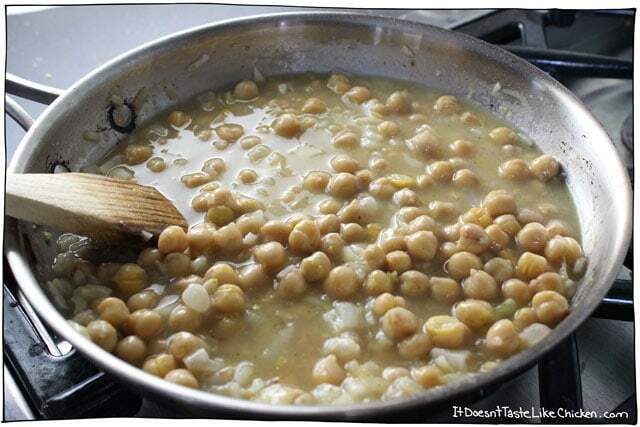 Add in the chickpeas and bring to a simmer. Simmer for 5 to 10 minutes until the sauce thickens, then stir in the coconut milk. If you find your sauce a little too thick, you can add more broth to thin, and if you find your sauce a little too thin, just cook down a bit more. Garnish with cilantro or parsley before serving. Perfect on pasta, toast, or served with a salad and potatoes. Heat the olive oil in a skillet over medium-high heat. 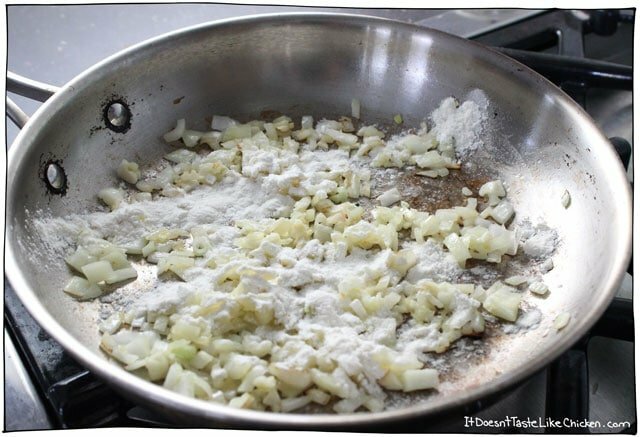 When hot add the onions and garlic and sauté until the onion turns translucent and begins to brown, about 5 minutes. Sprinkle in the flour and stir and cook for an additional 30 seconds to heat up the flour. Now add the vegetable broth, lemon juice, lemon zest, salt, and pepper. Stir and scrape the bottom of the pan to remove on any stuck on bits. Stir in the chickpeas and bring to a simmer. Cook for another 5 to 10 minutes until the sauce has thickened. Stir in the coconut milk. If you find your sauce a little too thick, you can add more broth to thin, and if you find your sauce a little too thin, just cook down a bit more. Garnish with cilantro or parsley and serve hot. This was so delicious!!! I added about 1/4 cup of shredded ginger. It was amazing!!! This was so delicious. 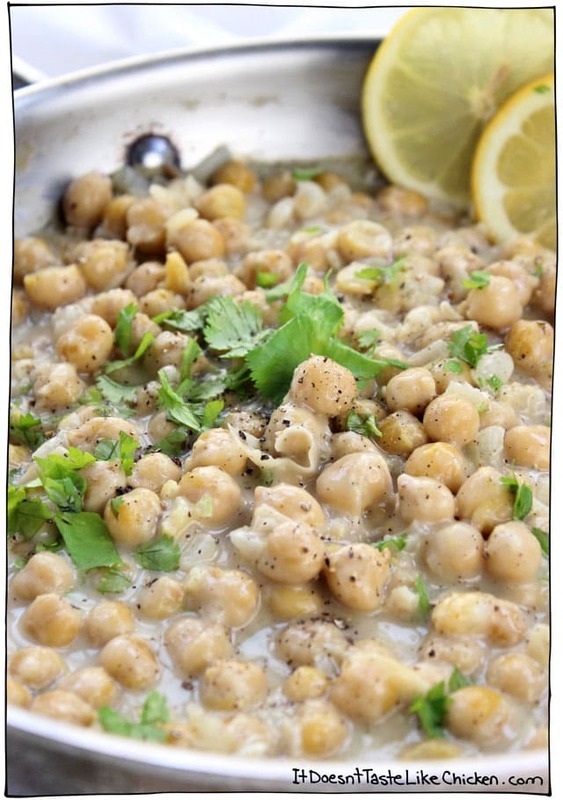 I was looking for a recipe to use up an excess of lemons and chickpeas, and it was a great coincidence to find yours! I served it over rice, and also wanted to consume the entire pan full. Congratulations on creating such a wonderful dinner. This is soooooo good!!! My omnivore hubby just asked me to make it again tomorrow so he can have it for his dinner! Thank you Sam. 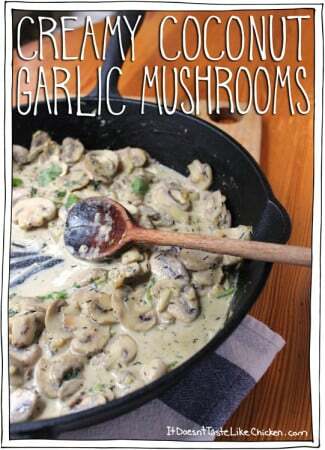 I just order your book cannot wait to get cooking! Made this, and absolutely loved it! Added artichokes to the recipe and served with a side of asparagus, but will have to try some of the other variations people mentioned in the comments! LOVED all the sauciness of it, it’d make a great pasta dish. I made this for the fam last night, Sam, even though I confess I had my doubts about it. Of course, I was being ridiculous––all your recipes turn out well. (Indeed, earlier in the day I made your Ultimate Vegan Chocolate Cake––always a hit.) This recipe was no exception. Lucky for the fam I summoned up a modicum of self-restraint and left some for them. 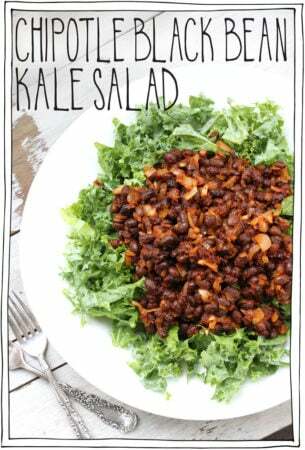 Next time I’m going to try adding chopped kale. Thanks for the recipe! Aboso-freaking delicious! The sauce.is perfect and so simple.that I was able to.make it with a 6 week old in tow. So perfect, Samantha. Thank you for another great dinner. You’re most welcome, Julianne, so happy you enjoyed it so much! This is our go to recipe when we don’t know what side dish to add to our food. 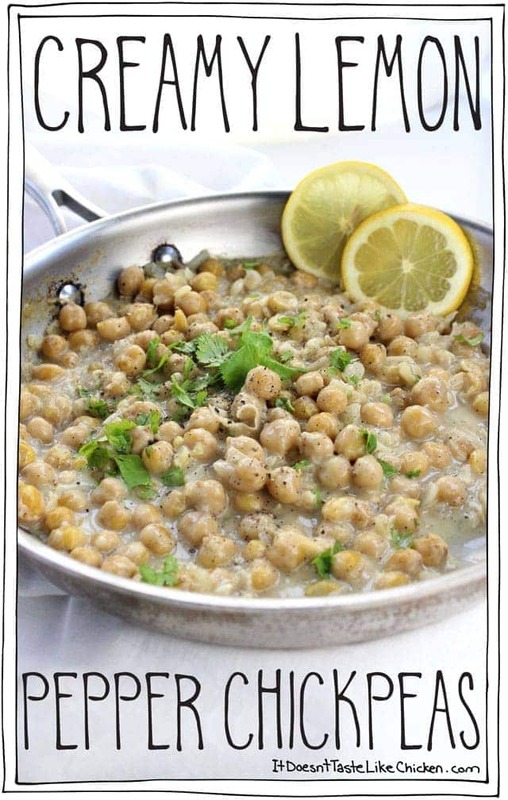 The chickpeas are sooo creamy and yummy and lemon+pepper is such a great combination. 10/10 would recommend to anyone. Good stuff! I cooked some chopped broccoli in the sauce along with the chickpeas, gave it one more hit of lemon at the end, and served over rice. Will definitely make again- so quick and easy! This is my favorite recipe of the month by far! I’ve made different variations of it. Today I swapped out the coconut milk for nutritional yeast and a little extra veggie broth. LOVE. Thank you! This was really good. I served it on top of a baked potato with a side of brussels sprouts. 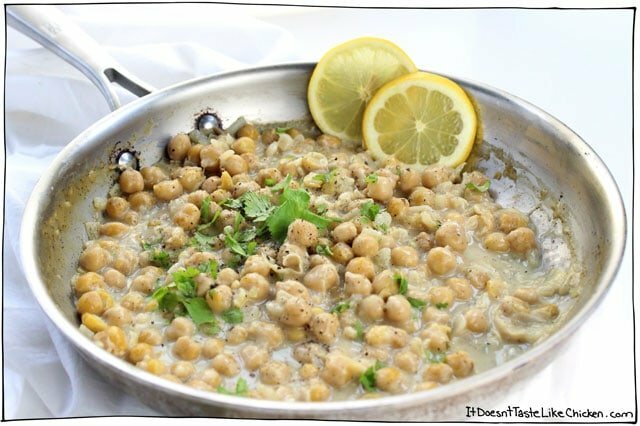 Chickpeas & lemons… what’s not to love??? 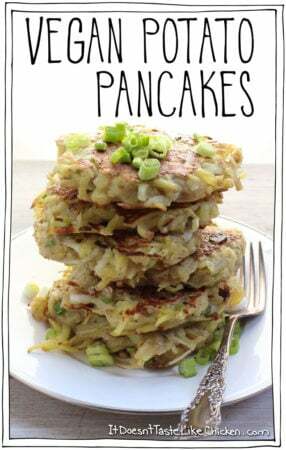 This recipe is awesome tasty and super easy! Served over cauli-pots (mashed cauliflower/potatoes). Another hit!!!! 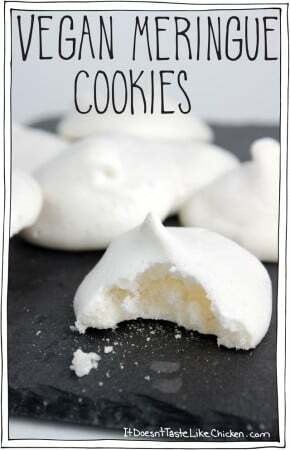 Easy to make and simply delicious! I served it over pasta (with plenty of extra fresh ground pepper) and it was a big hit. Reminded me of a seafood dish I used to love before I stopped eating sea critters. Thank you for sharing your experiments with us! Love this! I also love the # of servings calculator! 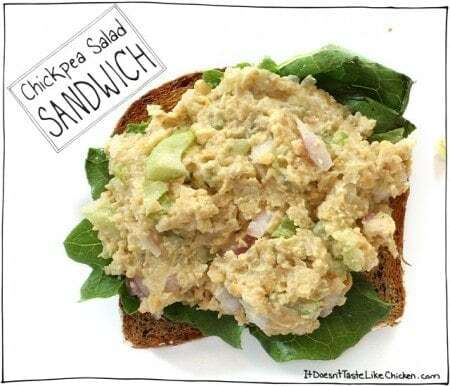 Agree – this is delicious and easy, and the servings calculator is awesome! Hi Sam! This looks great, and I’m definitely making this soon but I’m wondering how you would serve this? Over rice? Or just as is with potatoes and salad in the side? Thanks for all you do! Hi Ashlea! I had corrected a typo in this post, and now realise that I had deleted half of the post by accident. Oops! It’s restored now, so you can see both in the post and in the recipe itself that I have a few recommendations. Rice or potatoes would be great, as well as on top of pasta, or on toast. Omnomnom! This looks so good. It’s one recipe where I won’t have to double the sauce to satisfy my hubby who always likes lots of sauce so he can mix it in with the rice or mashed potatoes, really anything I serve with the saucy dish. I’m so loving your recipes! Love the new feature to adjust the recipe ingredients to servings! Thank you! I think I will try the chickpea recipe tonight! Also – full fat coconut milk – the canned version, correct? Not the refrigerated coconut milk?